I’ve been a work at home mom for a few months now, and I’ve learned several important lessons about balancing life and finances along the way. When I first started working from home as a mom, it was so easy to burn out. I tried to squeeze in work every second of the day, rocking the babies with my foot while I finished typing away on my MacBook Pro to complete a blog post. I was really stressed, tired, and felt like I was failing at pretty much everything. After a few months of that, I’ve re-structured things and have a better balance. There are still many days that don’t go as I planned, and that continues to be the hard part of being a work at home mom. The easy part, though, is enjoying all of the financial savings that come with working from home. Since then, though, I haven’t purchased any makeup at all. It’s not that I want to let myself go or anything. It’s just that I don’t really care what other people at the grocery store think of me (they’re too busy asking strange questions about the twins anyway.) I imagine this alone has saved me at least a hundred dollars if not more this year. There was a sidewalk sale in my small town this past weekend. Tons of stores put clothes out on the sidewalk at far reduced prices. In another life, I would have been in heaven, but as I looked through all the nice dresses and shoes, I simply had no reason to buy them. I have a blazer at home that I wear (with yoga pants of course) if I have to do a video interview, and it’s not like my husband and I are going out on the town to ritzy parties right now. I have some work clothes that I kept if I need to go to a conference or some other work function, but otherwise you can find me in some leggings and a sweatshirt. When you’re at an office job, you’re constantly exposed to other people. You’ve got your office bragger who loves talking about where they went that past weekend. You’ve got your office fashionista who is always wearing new shoes, and you definitely have someone who just bought a new car. All of those interactions, whether you realize it or not, make an impression on you. When you work outside the home, you’re also more likely to go out to eat, go shopping when you get off, grab a coffee on the way in, spend more in gas, etc. As a work at home mom, you’re free from the daily pressure of quite a number of those temptations. Some of those savings are more obvious than others, but the point is, there are numerous ways to cut costs when working from home. Do you work from home or do you want to? 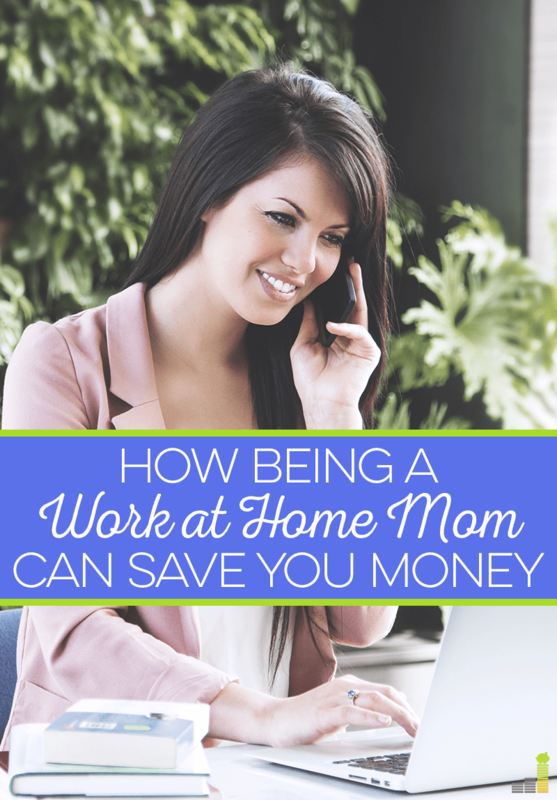 How do you save money as a work at home mom? Try running the numbers and compare hidden savings like the ones above to see if it’s right for you! Great post!! I work from home too and take advantage of all those savings you mentioned that come with it. Plus, not to mention saving on daycare!! I’m pretty sure we would be paying around $1500 minimum per month right now for both of our girls (ages 2 and 1). I also read a stat somewhere that unless you make $60K a year, it’s not worth it to go into an office if you have little kids. Interesting!! Um absolutely! Here in NJ it would be 2k for both kids for sure. Sounds good to me! I dislike the whole rigamarole of getting dressed and commuting to work every day. I feel like it would be much more efficient for me to work from home (I also feel like I would be much happier in my PJs with Frugal Hound at my feet…:) ). Indeed – there is the added benefit of Miss Julep getting to hang out with her people every day. There was a time where she was cooped up from 9-5. Great points! I work two days per week (during the academic year) at a college, but blog and run my very small business from home. I love this balance, but I have a long commute, which definitely uses some gas. I do find that I snack a lot more more when I’m home, so getting out of the house a few days a week is helpful in that regard! Ah yes snacking. I would have that problem if I could ever remember to go to the grocery store. My kids go to daycare while I work from home, but I still get to benefit from the things you mention. I rarely buy makeup or clothes and I probably only put gas in my car once every 3 months. The difference in how much I spend is huge when you compare it to how much I spent when I worked outside of the home. The gas savings is huge for us too for sure. You can also avoid all the stupid secret Santa and holiday expenses that come from working in an office. I am really torn this year about gift giving. I work in three offices but only one day a week each and I’m not sure if I need to buy gifts for employees. I always did when I was the boss but that isn’t the case now. Maybe I’ll just make a fruit basket? A fruit basket sounds legit, but then again I’m a huge scrooge. I’ve been WFH since March and I definitely agree with some of these advantages. On the downside, I’m finding I get less exercise, so I’m trying to rectify that by going for a walk at lunch time. Ah true. You can see how much that is a priority for me! Gotta work on it! Truth. I rarely fill up on gas! I save a decent amount of money on clothing now that I work from home. It’s been nice! I do the same thing when I have a video call. I will put on a nice shirt and cardigan or a blazer, but I’m often wearing yoga pants underneath haha! 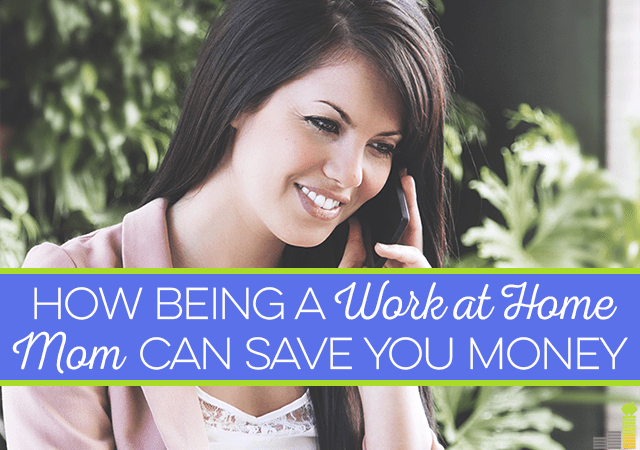 I am not a mom, but I have no doubt that working from home saves money. Just on transportation alone, if I were to work from home we’d save $600/month (we’d go down to being a one-car family). We were a one car family for quite some time but now we have two cars. Still they are both paid for and I rarely use mine. Since you have no commute you should also have more time to cook meals for the family or run errands in the middle of the day so you can have family time on the weekends, saving time and money. I am envious of those who can work from home but with what I do, it’s not really practical. Fortunately, I was able to relocate my office a few years ago, so now it’s only 5 minutes away. 🙂 I’d love to be able to work in yoga pants! I’ve noticed this as well. I don’t wear makeup every day (if I’m going out, I do), I’ve purchased maybe four things of clothes over the last year and a half, and I no longer have to worry about possibly falling for ordering lunch. The only thing I wonder about is if our utilities would decrease if I wasn’t home all the time, but I try to make sure I’m not using anything unnecessary. True. I run my utilities like crazy! Working at home was the best decision I have ever made! I can wear on my pajama whole day and I really loved it! Well, I don’t wear make up at all, just a powder and a perfume. You are doing better than I am with your powder and perfume haha!